Flexible, full-size silicone keyboard is spill-proof and fold-able. Bluetooth Version: 2.0. Compatible with all Bluetooth enabled devices such as mobile phones, mp3 players, multimedia devices, tablets including IPads, & computers. Bluetooth dongle is included-Plug & Play. Unlike traditional keyboards this silicone keyboard can be easily cleaned with a damp cloth or disinfectant spray. 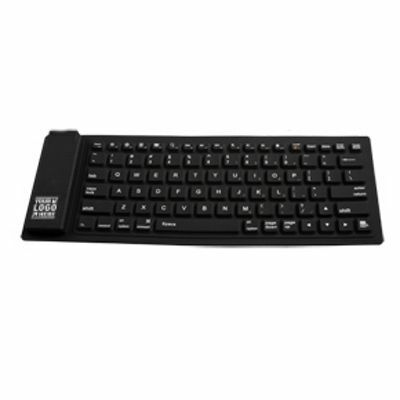 Included items for this keyboard are, built-in rechargeable battery, and USB cable. This product is great for anyone that uses their computer a lot and doesn’t like the traditional keyboards. It is combat able with any Bluetooth device. It is flimsy so you can fold it up a will return back to normal quickly on your desk. This keyboard is perfect for many businesses today as more and more are using tablets, IPads and other types of walking around blue tooth devices. Having this keyboard at a deck is nice to have and can be more productive and professional. For a more personalize touch on this keyboard you can put your business name and logo on the left side of the keyboard for a very low cost adding more branding to your business. Yearly companies have always tried to find the best ways to retain their customer data base by calling them monthly, stopping in to see them from time to time; but the best way is keeping your name in-front of them ALL DAY! This Bluetooth silicone keyboard does just that with your logo on it for everyone in the office to see. The real cost on getting new business is hard to measure and from what source you obtained it from; so keep in mind the real trick is to get your business name, and logo out in as many hands as you can for the lowest price with The Perfect Promotional Product that is hot right now.